First of all, I should apologize for being so scarce on the blog lately. As I mentioned in my last post, qualifying exams have been taking over my life in the worst way possible. But as of this afternoon, I am DONE...and man it feels good! I am SO happy to have my free time back to spend as I please rather than studying or writing for that damn exam. After I finished today, I immediately went to the gym and the grocery store then whipped up a few recipes. One of which included this awesome make-ahead breakfast idea: honey almond blueberry oat protein muffins. 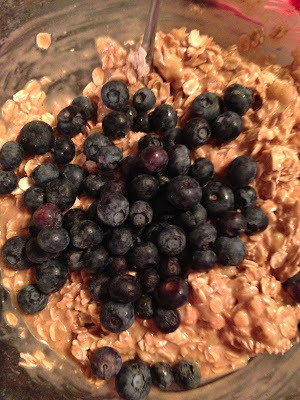 Easy, healthy, yummy, filling, clean. Okay, I know the recipe name -- honey almond blueberry oat protein muffins -- is ridiculously long. But I couldn't help it. These muffins are chock full of awesomeness and I didn't want to leave anything out! Actually, I really wanted to fit "banana" in there somewhere too but resisted. I love blueberry muffins and randomly got a craving for one last night when I saw someone on TV eating a big, delicious looking blueberry muffin. So I decided to try to make a clean version full of fiber and protein for filling, make-ahead breakfasts. I'm not a baker (at all) so I'm pretty proud that they worked out. Especially since I didn't include flour, butter, oil, or refined sugar... the recipe was a bit risky. But it worked! They're dense and chewy and sweet -- but not too sweet -- from the honey and banana. No, they don't taste like the blueberry muffins from Dunkin Donuts, but you'll feel a heck of a lot better after eating one. This is definitely a flexible recipe. Play around with it and see what works for you... add peanut butter instead of almond butter, toss in some dark chocolate chips, add some ground flax seed... whatever you'd like! Let me tell you how they're SUPER delicious though: warmed up in the microwave for 15 seconds and spread with a bit of coconut oil. YUM. In a large bowl, add 2 cups old fashioned rolled oats (not the quick kind), 1/4 cup vanilla protein powder, 1/2 tsp baking soda, 1/4 tsp sea salt, and 1/4 tsp cinnamon. 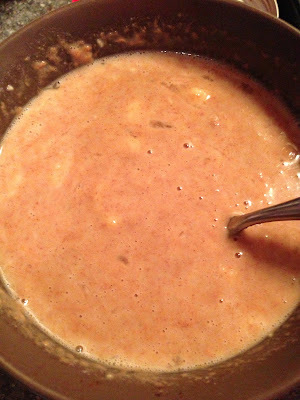 In a separate bowl, mash a ripe banana with a fork. Whisk in an egg. Add in 1/4 cup almond milk, 1/2 cup plain greek yogurt, 1/2 cup almond butter, and 1/4 cup honey. Now, gently fold in 1 cup of fresh blueberries. I saved a few to place on top of the muffins rather than mixing in (just for aesthetics though, so either way is fine). Scoop evenly into a muffin pan sprayed lightly with cooking spray. You should have enough for 12 medium-sized muffins. Top with extra blueberries and some sliced raw almonds. Bake at 350 degrees for 22-25 minutes, or until a knife inserted in the middle comes out clean. 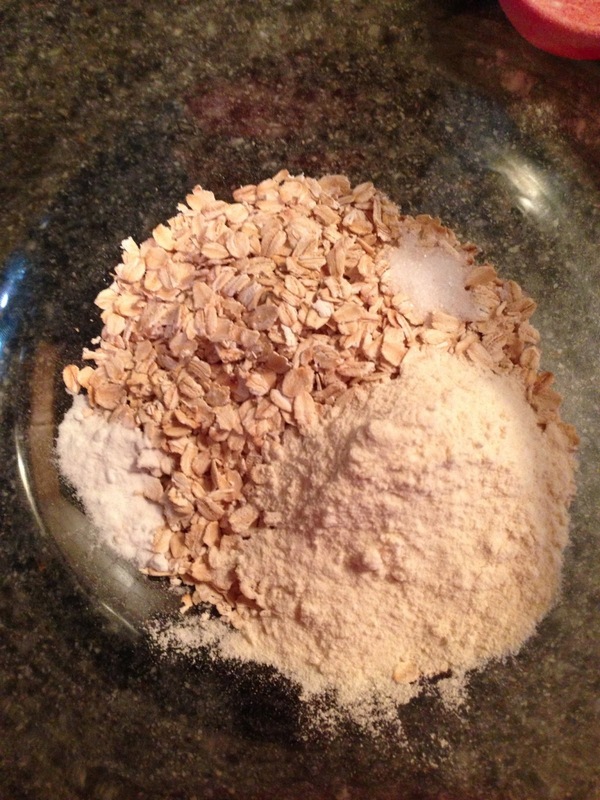 -In a large bowl, combine oats, protein powder, baking soda, salt, and cinnamon. Mix gently. -In another medium bowl, mash banana completely with a fork. Whisk in the egg. Add the almond butter and combine. 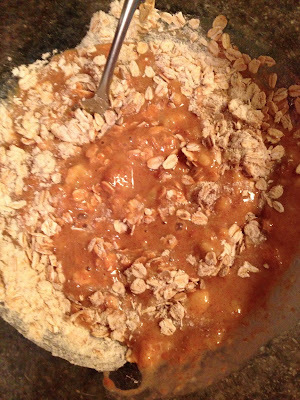 Add in milk, yogurt, and honey. Whisk until smooth. -Pour the wet ingredients into the dry ingredients. Stir until combined. Gently fold in the blueberries, reserving some to place on top of the muffins if you'd like. -Spray a nonstick muffin pan with cooking spray. 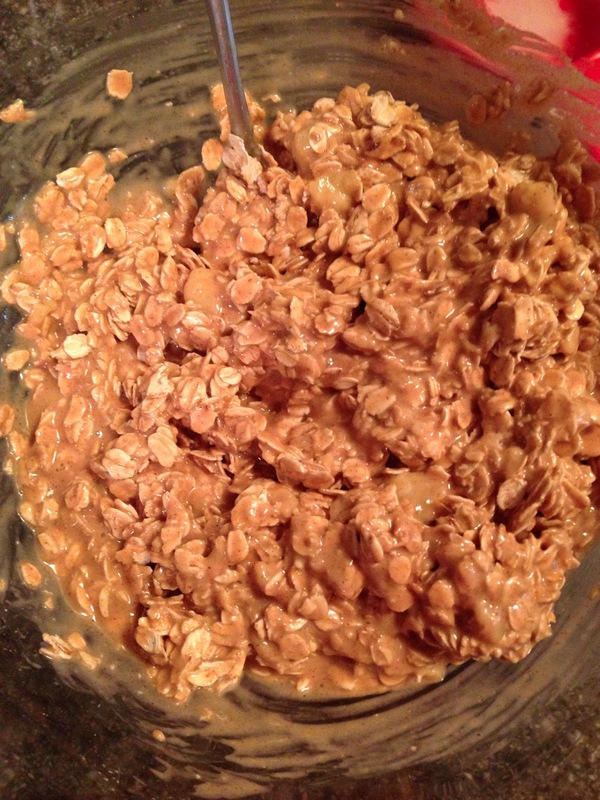 Spoon the mixture evenly into the cups, filling about 3/4 way. 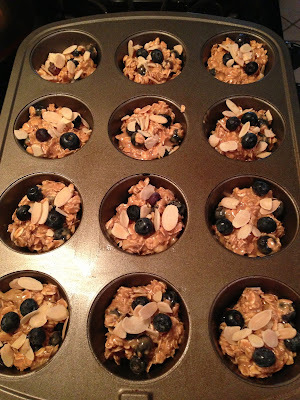 Top each muffin with a few of the reserved blueberries and a sprinkle of raw sliced almonds. -Bake for 22-25 minutes, or until a knife inserted in the center comes out clean. These are amazing- my new favorite breakfast! These look amazing! I'm going to try them out this weekend. Thanks for the recipe! Any substitutions for protein powder? Yep, you could use ground oats (or just more whole oats), ground flax seed, wheat germ.... basically any dry ingredient that would go in muffins. If you do this, I would add a bit of vanilla extract for flavor. Do you refrigerate these or store them on the counter? I just made a big batch (they are delicious, by the way!) and am trying to debate how to store them. I store them on the counter in Tupperware. Glad you like them! Mine molded within 4 days on the counter. It's probably this awful SoCal weather. I'm making a new batch now & will store them in the fridge. Hopefully they will keep better! Darn, sorry for leading you astray! The weather definitely might play a role... plus the fact that I guess I usually eat them all in less than 4 days ;) Let me know if storing in the fridge works better for you! Girl! I just made these and they are thebomb.com! Way to go! Do you have the nutrition info on these? I just calculated about 172 calories a muffin. The almond butter and honey add a lot of calories. Just made these... so excited to try them! Jenna, were you able to get the nutrition on them? Has anyone been able to calculate the nutrition on these? They sound delicious, but I want to make sure they work for my nutritional needs first! Any substitution for the banana. I hate bananas in anything but these look so delicious.